an experience that leaves us speachless any time we have the lucky chance to have a glass of wine or a spritz there. The Piazza and the aperitif rite, for locals and visitors, every day at sunset. And every day our emotions are newly fresh as the very first day!. 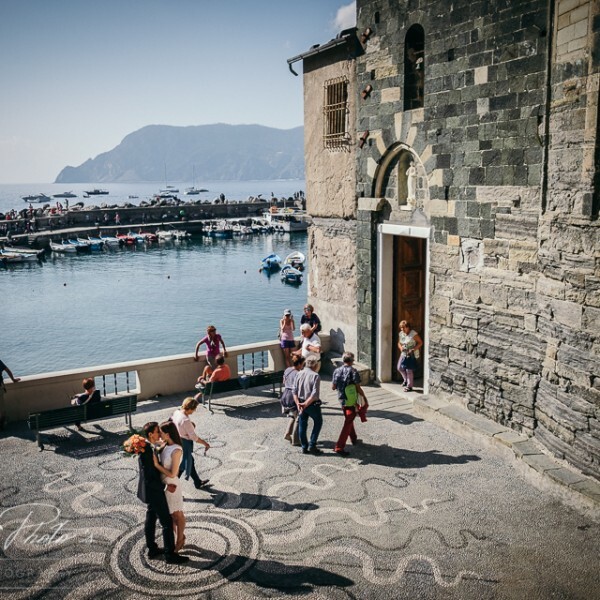 Love and beauty, peace and serenity pervade any stone, buildings, sun umbrella and spot of Piazza Marconi, since Vernazza life is all there, at that peculiar moment of the day and no other place seem more attractive than this. It’s sunset and everybody is attracted as by a magnet to the splendour and the bright, flaming colours of the Piazza. and while the wine red color blends and mingles with the square colours below… people from Al Castello Restaurant enjoy the view of the village lingering on their drinks while sitting in the so called “Via Veneto” promenade. no matter it’s Negroni in a glass or Milk in a bottle, it’s aperitif time for everybody in Vernazza! Goodbye golden sun…hello darkness…Goodnight to all the Cinque Terre people…tomorrow it’s another day and another flaming sunset is waiting for us handling us a golden aperitif cup as beloved promised land to our daily troubles. And another Aperitif Time will be waiting for us!